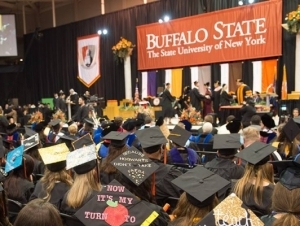 Buffalo State College will confer degrees on 1,752 undergraduate and 509 graduate students during its 145th commencement celebration, Saturday, May 13, in the Sports Arena. Degree candidates will be honored at morning (9:00 a.m.) and afternoon (1:00 p.m.) baccalaureate ceremonies and an evening (5:00 p.m.) master’s hooding and C.A.S. ceremony. The 9:00 a.m. ceremony is for degree candidates from the School of Education, School of the Professions, and University College. The 1:00 p.m. ceremony is for degree candidates from the School of Arts and Humanities and School of Natural and Social Sciences. The following graduates of the Class of 2017 will be honored with the SUNY Chancellor’s Award for Student Excellence in recognition of their academic and extracurricular achievements, leadership, and service: Jon Battison, Alexia Matos-Mateo, Jeremiah Perez-Torres, Carly Pershyn, and Lydia Sigurdson (undergraduate students), and Monique Owens (graduate student). Battison will address the audiences at the morning and afternoon ceremonies as the recipient of the President’s Medal for Outstanding Undergraduate Student. Heather McCarthy will deliver an address at the evening ceremony as the recipient of the President’s Medal for Outstanding Graduate Student. Eduard Feibischoff, ’79, an Emmy Award–winning television sports producer, will receive the Distinguished Alumnus Award and deliver the commencement address at the morning and afternoon ceremonies. Bahira Sherif Trask, professor and chair of human development and family studies at the University of Delaware, will deliver the commencement address at the evening ceremony. A Distinguished Alumnus Award will be granted to Ruthann E. Grey, ’66, ’71, a retired national and global business executive, at the morning ceremony, and Gregory T. Clabeaux, ’03, a board-certified vascular and general surgeon, will receive the Young Alumnus Achievement Award at the afternoon ceremony. In addition, the President’s Distinguished Service Award will be presented to Paul J. Lamparelli, ’82, president of Lamparelli Construction, at the morning ceremony. Faculty and staff are encouraged to celebrate the accomplishments of our graduates and join them in this special day by marching in the academic procession or by serving as a volunteer. Marchers and volunteer ushers are still welcome to register for the 9:00 a.m., 1:00 p.m., and 5:00 p.m. ceremonies if they have not already done so. The printed program booklet distributed to graduates and guests and live video streaming of the ceremonies will be posted on the Commencement website on Commencement morning.